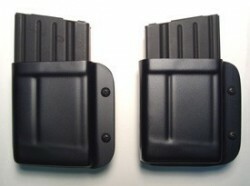 Specifically Molded to fit the DPMS AR-10 Magazine. Tech-Lok back is adjustable for belt width and does not require you to remove your belt for installation. Tension adjustable screws for custom feel. Fits 20 Round .308 Magazines.